DDG Board members and visitors at the meeting in Santo Domingo on November 6, 2017. From left, front row: The Rev. Deacon Beth Drew, Diocese of Western Michigan, President; Bill Kunkle, Southwestern Florida, Executive Director; the Rt. Rev. Moisés Quezada, Dominican Republic, First Vice-President; the Rt. Rev. Julio C. Holguīn, Dominican Republic; the Rt. Rev. William J. Skilton, Dominican Republic; the Rev. Deacon Bob Snow, Nebraska. Second row, from left: Thomas McGowan, Nebraska; Karen Carroll, Dominican Republic; Melissa Peeler, Nebraska; Ann Reese, Nebraska; Joanne Lemieux, Western Michigan; Joy Holl, South Carolina; Bonnie Gruetzmacher, The Episcopal Church in South Carolina; Harriet Green, Western Louisiana; the Rev. Deacon Alexander Romero, Dominican Republic; Debbe Causey Skilton, Dominican Republic; the Rt. Rev. Michael Garrison, Southwest Florida; Carol Garrison, Southwest Florida; Julia Ariail, Georgia, Secretary; Ellen Snow, Nebraska; Charlie Nakash, Dominican Republic. Back row, from left: Katie Forsyth, Eastern Michigan; David Morrow, Northwest Texas, Treasurer; Eric Travis, Michigan; John Gruetzmacher, The Episcopal Church in South Carolina; Don Peeler, Nebraska; the Rev. Hilario Albert, New York; Rick Reese, Nebraska; the Rev. Mark Bozzuti-Jones, New York; Bob Stevens (Southwest Florida); Julius Ariail, Georgia, the Rev. John Shaffer, Nebraska. The Board of Directors of the Dominican Development Group met in the Obispo Holly conference room in the diocesan office building in Santo Domingo on November 6, 2017. The board members and visitors represented the following dioceses: Dominican Republic, Eastern Michigan, Georgia, Michigan, Nebraska, New York, Northwest Texas, South Carolina, Southwest Florida, and Western Michigan. 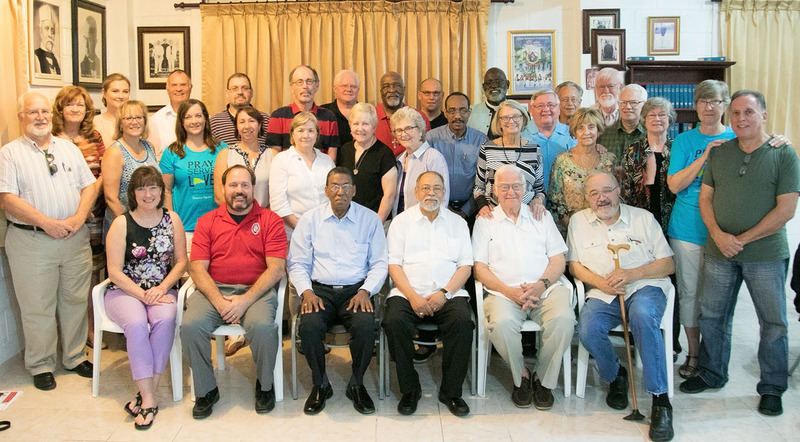 During the meeting, the board members were excited to hear about a significant improvement in the financial status of the Diocese of the Dominican Republic in 2017. The Dominican Episcopal church has now reached a significant milestone in its goal of financial self-sufficiency. The Dominican Development Group launched the La Paloma Endowment campaign in February 2017 which set a goal of raising the endowment to US$10 million. This campaign focused on the November 1st retirement of Bishop Holguin and his legacy as diocesan bishop for more than 26 years, and aimed to provide a solid base for Bishop Moisés Quesada to begin his service as diocesan bishop. To date the campaign has raised over US$290,000. We are now less than US$248,000 from reaching our goal. We are continuing the campaign through the end of this year in hopes of completing our goal. 2017 marked the 13th year since the establishment of the Dominican diocese’s Endowment Fund or FOCA (Fondo de Autosuficiencia) in 2004. Under the leadership of Bishop Julio Holguin (retired) and expert investment strategy developed by the Dominican committee in charge of the fund, the diocese has realized significant gains in this Endowment, which after receiving the donations from the La Paloma campaign had a value of approximately US$9,752,000 as of October 31, 2017. The annual proceeds from this Endowment are currently funding more than 60% of the diocesan budget. The next board meeting will be held on February 12, 2018 in Santo Domingo following the DR diocesan convention on February 9-11, 2018. Copies of the draft minutes from the 11/06/2017 meeting and all of the reports and other documents distributed at this meeting are linked below.